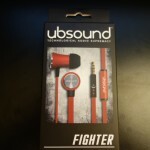 The packaging is quite simple, it’s very small but is well designed to fit the earphone and make it look like a “fighter” up against a wall. What you get inside the box is very simplistic – S, M, L silicone tips and a soft carrying pouch is what you’ll find alongside the earphones. I would have liked to see a shirt clip and even a greater array of tips included. Overall, at the given price tag of £60 – it’s a little disappointing that there wasn’t anything more included. Furthermore, the silicone tips included aren’t of the best quality and feel a little cheap in comparison to other earphones. 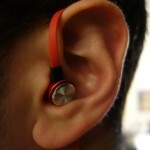 The build quality of the earphones is good, although not perfect. There’s few things that I don’t like with the earphone’s build quality. 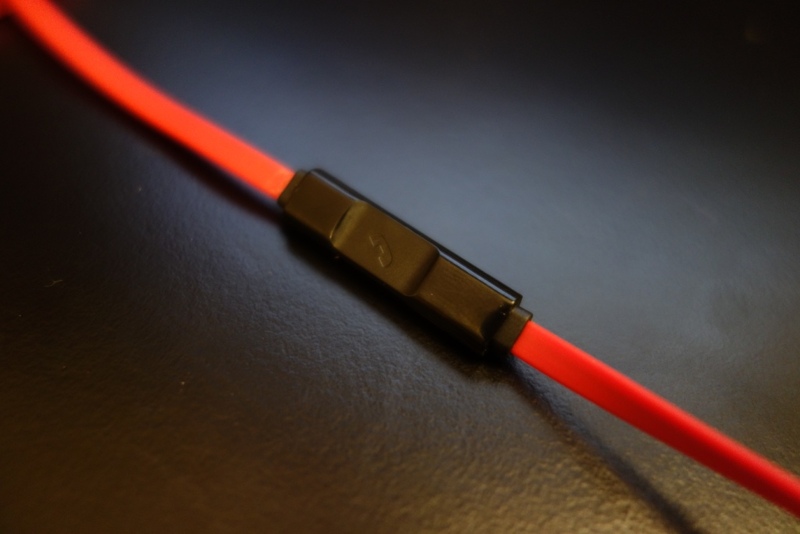 First of all the cable is a nice touch, being flat as it prevents it from tangling, however from experience, I’ve always found flat cables to cause a problem with microphonics – and the Fighter was no exception. There was horrible cable-noise coming from the earphones, whilst they were worn straight-down. 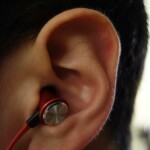 However, when the earphones were worn over-the-ear, the cable noise was almost fully eliminated. Now this might seem an easy fix, but with a flat-cable design, it becomes uncomfortable to wear them over-the-ear for a prolonged amount of time, especially if you wear glasses. In my case, I found the flat cable to be a little bit hit and miss. I do like the fact that they don’t tangle easy, but I would happily sacrificed that for being able to wear them straight down without having to worry about cable noise. 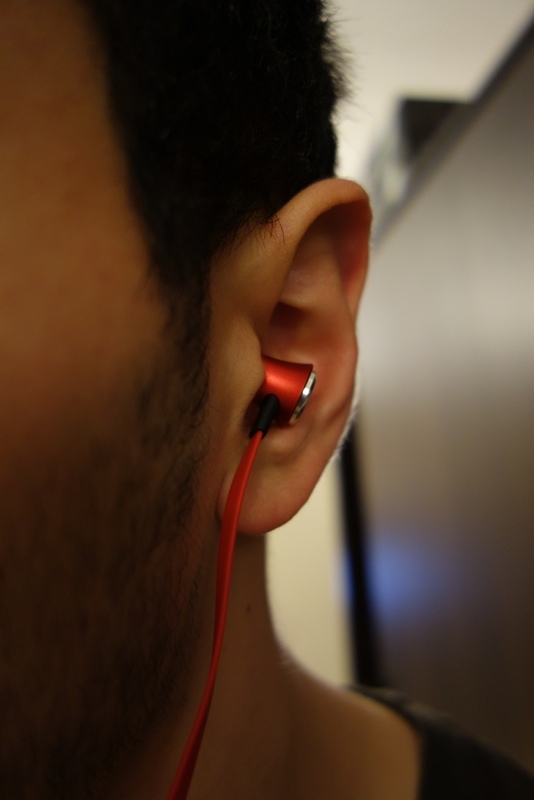 It should be noted a hybrid approach, found on the Steelseries Flux In-Ear Pro, is honestly to me the best approach – combining a flat cable with the comfort of a rounded cable design over-the-ear. 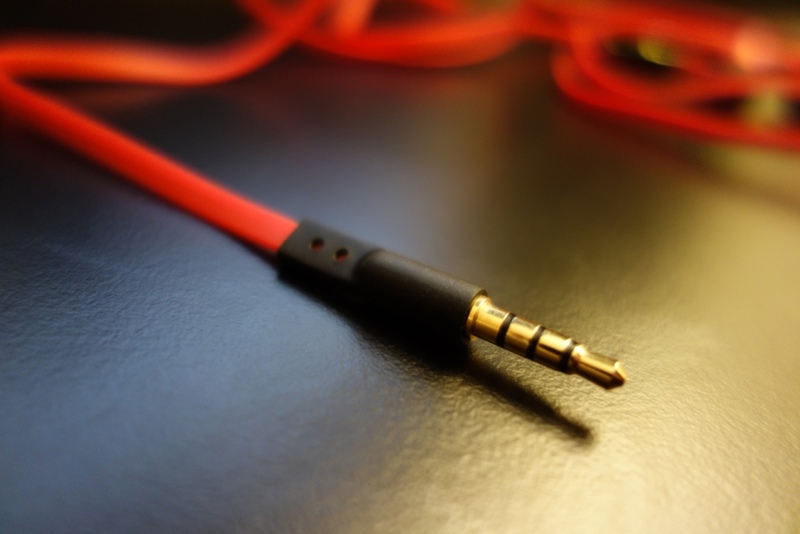 As I also look at the cable, it’s a little disappointing to find it terminated with a straight gold-plated 3.5mm jack, rather than a right angle jack. I’ve found that via prior experience a straight jack causes problems down the line, as you tend to pull from the wire, rather than the jack when removing it from your source. Now moving to what I liked about the build quality. First of all the actual build quality of the earphone is excellent – it’s paint coating and overall design means that it’s a tough cookie. I also really like the fact that it has an in-line mic that can be used for calls or music controls (ie play/pause). Furthermore the cable splitter for the right and left earphones is also finished with this metallic look, which again shows a nice build quality and gives off a good impression. Overall, the build quality could be improved, but overall it’s good. The design of the earphone really make the earphones shine and the fact that you have a flat cable means that it won’t tangle easily. As mentioned above, the looks are actually very nice. The Fighter comes in 4 different colours, Black, Blue, White and Red. The red version I have, looks really nice. From the red cable to the metallic design of the earphones. 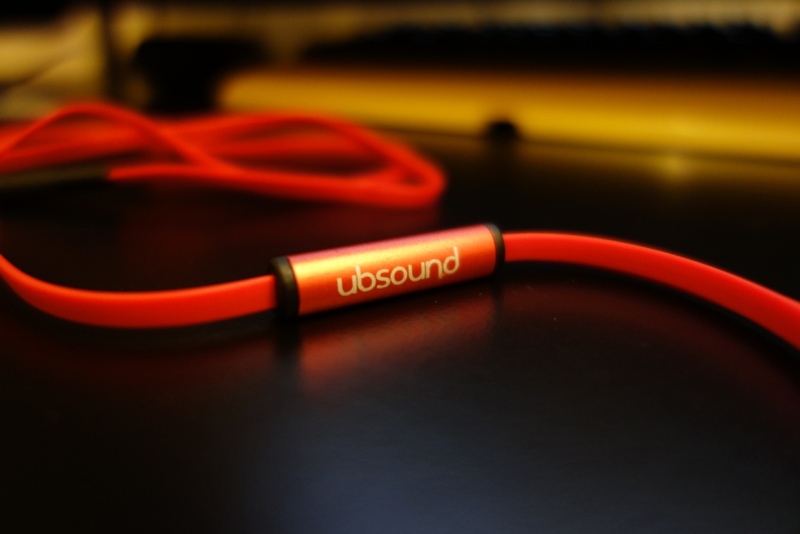 UBSOUND have done a great job here, designing the earphone. I guess that’s what happens when there’s Italian influence behind it! 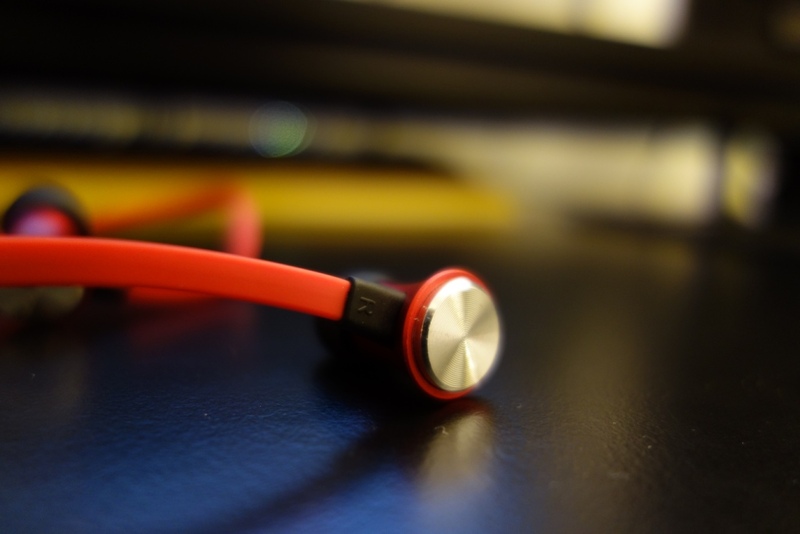 The isolation of the earphones is on-par with other earphones of its size and form. 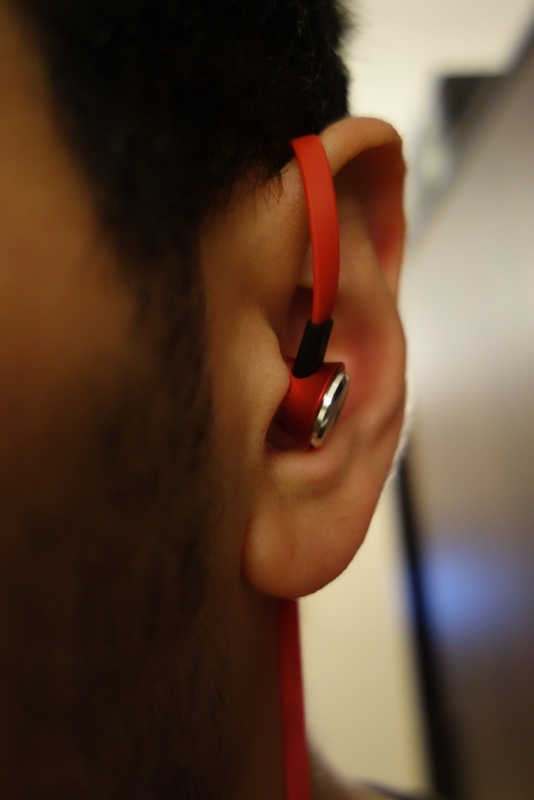 It’s got decent passive noise cancellation, but is limited by its form-factor. The comfort of the earphone, as previously mentioned is a little hit and miss. Due to having to wear these over-the-ear I wasn’t that comfortable wearing them for a long period of time, due to the flat-cable design being a little bit annoying, especially whilst wearing glasses. The weight of the earphones won’t cause a problem though – despite their “heavy” look due to them looking like metallic earphones, they’re in fact very light in-ear. 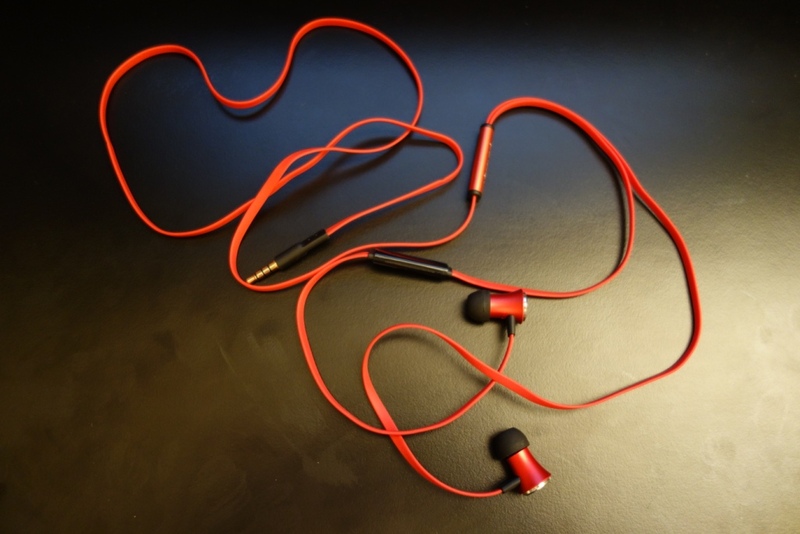 So other than the cable, the earphones are very much comfortable to wear, especially due to their cone-shape design. 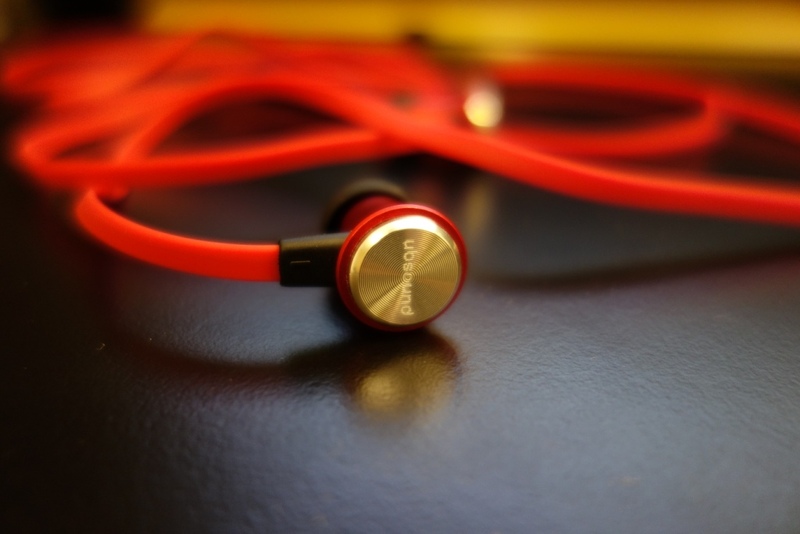 Now the sound quality as mentioned by Clara at UBSOUND is absolutely perfect for describing the earphones. They very much have a V-Shaped sound signature, thus having a lot of emphasis on the lows, having a good extension in the highs and unfortunately inheriting recessed mids. The overall sound presentation is a warm sound signature which is really dominated by the low-end frequencies. The lows for me were the talking point of this earphone. So much so that I would class them as a basshead earphone. Competing with the likes of the Fischer Audio Eterna or even Audio-Technica ATH-CKS-77. For starters, the mid-bass has a nice heavy slam, which is pronounced and accurate. The sub-bass is what really interests me as a lot of earphones that have a large mid-bass slam, seem to forget about the extension into the sub-bass region. In this respect, I was really impressed with the sub-bass extension – it really extended well and impressed me to say the least. Due to a heavy emphasis on the lows, the mids take a significant hit. They’re quite recessed and really pushed back. It’s a little shame, as I would have preferred to sacrifice a bit of that mid-bass for better mids. I feel that a lot of people who might listen to non-bassy music would really dislike this earphone as it doesn’t really shine in the mids, meaning you would be left with a pushed back sounding earphone. It’s a real shame, although I was previously warned by UBSOUND about this and they weren’t lying. 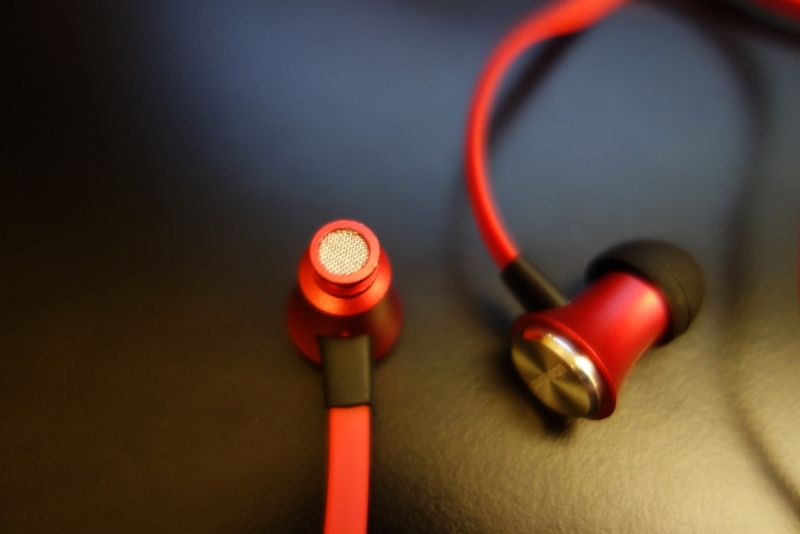 The highs on the other hand have a nice sparkle to them – they don’t fully extend, although that’s to be expected by an earphone in its price category. The soundstage is just about right – it could have more depth to it, but yet again, due to its price-point, I can’t be overly critical. It has a decent width, and overall has a nice tonal separation. Overall, the earphones sound decent, if you’re into bassy music or are a basshead. Personally, I quite enjoyed them, because I listen to a lot of bass orientated music, however the mids left me wanting more which was a shame. The overall presentation is great and I really like how they have gone about with being honest and down-to-earth about the sound signature. However it should be said that the price-point they come in at is quite competitive – there’s a lot of earphones in this price category and it means that breaking through the market might prove hard for UBSOUND – although time will tell. To conclude, I feel that the earphones are very much V shaped sounding earphones and do have this strong bass presence. If you’re looking for mids and a more neutral non-bassy tone, then I would look elsewhere. Dear Totally Dubbed team, first of all, congrats for the great review, which is clear and rich in details. I bought these IEMs on Xmas and just finished the burn-in period. Stellar design and also the flat tangle free wire is ok at the end of th day, I mean not so bad even used cable down. Poor accessories pack included right, but luckly the M size of the tips included has a perfect fit with my ears and a great isolation as well. 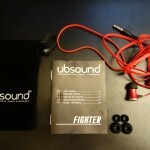 I would say very satisfy for these Fighter earphones, with a good value for money range (paid 63£). Go well everybody, cheers, W.
Thanks! Great hearing your experience from it too.